Or, as some wags put it, haplogy. Is this the same phenomenon as in "Febyuary"? The latter pronunciation would imply for me a transparent derivation from a verb *teriorate or the like. (Thus I would have /di-/ in "defenestrate" and "declaw", but /dɪ-/ in "declare" or "defend".). I guess this is due to the studded-studied merger (or, in my case, split). Please remember that the symbol "i" in this transcription stands for "/iː/ or /ɪ/". In defenestrate I would expect a definite /iː/, possibly stressed -- something I would not expect in deteriorate. See the LPD entry for de-. 4nd 1f 1 wr1t3 l1k3 th15, w1ll y0u d3-l33t my p05t? For me, defenestrate has /ɪ/ (or in fact schwa, since I have the Weak Vowel Merger). But I probably say Defenestrate him! way more often than the average anglophone, because in my subculture that's an appropriate response to a truly awful pun, and not just the verb for a long-ago and far-away historical event. I apologise in advance for an almost off-topic reply, but I wonder if I am the only reader who regularly has problems identifying the fourth letter (fifth symbol) of "diˈtɪərieɪt" when it appears in bold (as in John's article, above) ? My eye/brain insist on interpreting this symbol (a bold small caps "ɪ") as a "z", almost certainly because of the upper- and lower bars, as a result of which I almost invariably fail to correctly identify the word being phonetically spelled. Yes, that does help, but I find that it needs three levels of zoom before the character is clearly a small-caps "i"; I have now reset my preferred font size to 20px (from 16), and just hope this doesn't have an adverse effect on other sites that I visit. In this view a word “exists” only if it’s in standard dictionaries. And the word is its spelling. You've neatly summed up the traditional view that thinks of speech as merely an attempt to communicate the true, written form of a language, rather than the other way around (where writing is an attempt to communicate the spoken form), which is probably closer to the truth. 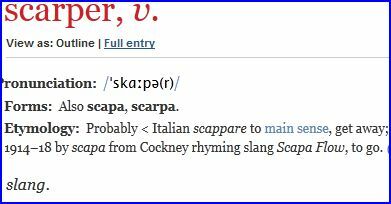 But I don't think it's fair to say that the correct pronunciation (in this view) is necessarily the one that follows the spelling. The traditional view does in fact allow for irregular spellings, but I think it sees them as irregular pronunciations. I remember a friend remarking on the name of the country Tanzania tænzənˈɪə and saying "It should be pronounced tænˈzeɪnɪə". I replied, "You mean it should be spelt Tanzaneer", but the primacy of written language was so deeply embedded in his thinking that I don't think he saw my point. I agree with you, though if I wanted to play devil's advocate I could suggest that it would more likely have been anglicised with initial /tʌn-/ if it wasn't for the spelling. Haplology is a recognised process in pronunciation change, so why not? (But Blogspot protests violently with its red ink). I agree it isn't dissimilation (where two similar items are altered to something less similar) but explanations of haplology tend to drift into dissimilation. The consequence of haplology is reduction, simplification, suppletion - words become shorter by omitting one of the similar sequences. "February" is a good candidate for haplology, but weak syllables live dangerously anyway. "January" is not a candidate for haplology, but we have everyday pronunciations "Janry" and "Febry" along with other -ary words, (some, like "momentry", also having haplology lurking in the background). Confession time. I'm a deteriationist. I've been away from the UK for so many years so I can't claim responsibility for the current popularity. But it does indicate that "deteriate" is at least as old as me. Your warning triangle also shows you must've been aware of it for some time. Not Blogspot but your browser. Thank you. But that must mean we all use different spelling checkers, with possibly different results. And rightly so, for we are writing in different language varieties. If I write "centre", it's a typo, and I want a red wavy underline; if you write it, it's correct, and you don't want one. But I write "mediaeval" and damn the underline. "But I write "mediaeval" and damn the underline". Oh Halleluja, if only more did; I was beginning to think I was the last person on this planet to so spell that word. But for you, John, how many syllables in normal speech ? I have four, but many of my peers now have only three. Four: /mɛdi.ivəl/, thanks to happy-tensing. At least when pronounced lento: I make no guarantees about what might happen at allegro tempi. Why does 'murderer' never get haplologised? Because of 'murder'? In German there is Zauber, charm, spell, trick, Zauberer, wizzard or such, but Zauberin (rather than *Zaubererin), witch. But while lehr- is to teach, Lehrer is teacher, a 'teacheresse', female teacher, is not *Lehrin but Lehrerin. 'So in this view a word “exists” only if it’s in standard dictionaries. And the word is its spelling. (I agree that this view is extremely naive). But, no matter how naive, a view like that if held for long enough time by many enough people becomes true, for all its naivite', in the very virtue of being generally held. No? "murderer" is a candidate for haplology in a rhotic variety of English, so the first hurdle would be any inhibition held by people in that community. And yes, if enough people gather round some language feature they'll very likely win the day, especially if there's also an incentive. Hypercorrections are a good example, usually short-lived whenever people produce them momentarily, but sometimes catching on and becoming adopted by the community at large. That's how we got Bristol for Bristow. I would say yes, because of murder. Or, more particularly, because it's murder + -er. I disagree with Sidney Wood. I don't think it's ever a candidate for haplology. (I'm a rhotic speaker of English.) A murderer is one who murders. So the word always needs murder + -er. Because "murder" cannot be shortened to "murd". In my own version of spoken English (ridiculous, as I next to never speak English) I could, perchance, imagine a haplologised (sort of) version of 'murderer', with 'd' sort of geminated or momentarily unreleased and then again released (difficult to exemplify otherwise than orally) sounds a bit like the emphatic 'd' in Arabic, or perhaps the 'cerebral' Sanskrt 'd', as if to compensate for the disappearing 'r'. In my record collection there are two songs both collected by folklorist from Southern Blacks, both using Murder+SUFFIX Home as a title referring to a penal institution (prison or penitentiary) housing violent men. Both collectors used the spelling Murderers' Home, but what the singers actually sung was a dissyllable that could equally be heard as Murder's Home or Murderous Home. Not exactly a coincidence that the two folklorists agreed. One was Alan Lomax and the other was his father John Lomax. Thank you Ellen Kozisek. I would like to think that we agree nevertheless. Your assurance that the morphological structure of the "erer" sequence would block reduction of "murder" in your rhotic English is an example of what I meant by inhibition. I didn't spell it out because Wojciech had just given some German examples at a morpheme boundary, where the reductions were arbitrary, which is a very different issue. Although my English is non-rhotic, I intuitively share your sense that "murder" wouldn't be shortened by haplology in "murder+er" despite the two identical syllables. This is not like Wojcech's German examples, where the root remains intact and any haplology hits the suffix. The reduction that I do make in my non-rhotic English is not haplology: [mɜ:də] vs [mɜ:dr+ə] (+er), it's simply elision of the weakest vowel in "murderer" after restoring the linking r.
I don't know if [mɜ:rdr+ər] is possible in EK's English (ignoring any r-coloured vowels for now). If it is, it would'nt be a case of haplology either. David Crosby, those examples from your song collection do seem to haplologies, by skipping the entire suffix -er (I still wouldn't expect the final er of "murder" to be skipped leaving the suffix -er intact, but so what if you can't tell). I'd at least expect [z] in "murderers' home" and [s] in "murderous home", but maybe the Lomaxes have [s] in both. I don't think these singers would make a consistent distinction while singing between z and s here. Murder Home 1 and Murder Home 2. • Lomax Senior consistently chose Murderer's. • Lomax Junior was inconsistent — at one point using the spelling murd'er's. It seems to have been Pye Records (a UK label) that chose Murderer's. justly (in my h.o.) decried as such by Prof. Wells, not simply true---or if not, then 'true-ish' and standing a good chance of becoming true? I am not talking about occasional hypercorrectisms like 'Bristol' but an overall stance towards language as such. Maybe, in the matter at issue, the naive view _has_ already become true in the truest sense of this word...? Your view would interest me. I mentioned established hyper-corrections as an example because they're so easy to confirm later on. And you can generally see the forces involved, not just numbers in favour, but also incentive and stigma that persuade people to modify their speech, whether towards an established norm, or away from it. The causes of other linguistic changes are not so obvious. Why was the inflectional morphology of case lost on the way from Latin to French, while the far more complex case morphology of the Turkic and Fenno-Ugric languages is still maintained right across Asia? Your example of Croatian and Serbian stands on an extreme use of incentive and stigma. If you have the political power and the will, you can legislate on any aspect of language. You can proclaim a language, you can abolish a language, you can impose penalties. Still, you'll probably have more success if your political power is backed up by numbers in the population. The list is infinitely long. Europe is full of examples, both contemporary and from history. Thank you Sid, tack saa mycket, det aer allt mycket bra, but i meant something else. John Wells denounces the naive view that words do not exist if they be not listed in standard dictionaries and that they be identical with their spellings. I can't help feeling that the view criticised by John is naive indeed, extremely naive even. But then, I can't feeling other things that are (they say) plainly wrong, such as that Croatian and Serbian are the same language (against D. Crystal: not in the way in which Swedish and Danish are the same language /they are not/), yet people _believe_ they are two different language, and _by the very self-same token_ they _are_ 2 distinct languages. Hence, my perhaps slightly provocative-sounding though quite ingenuous and innocuous question: is the view denounced by John not simply true? And that in virtue of being simply held, and having been held since the expansion of literacy (in England: since King Alfred's times)? 2. Latin declensions are _way_ more complex than anything you find in F-U or T.
3. F.-U. or T. cases are 'looser' (agglutinavely glued to the stems) than the Indoeuropean, they are like the Japanese postpositions -wa, -wo, -no, -ni etc. which normally don't count as true cases. Is that quite wrong you think? Sid asks: "Why was the inflectional morphology of case lost on the way from Latin to French, while the far more complex case morphology of the Turkic and Fenno-Ugric languages is still maintained right across Asia?" The answer to that is well understood, and in fact is phonological. Classical Latin had weak dynamic stress on the penult or antepenult, which in Vulgar Latin intensified, possibly under the influence of Germanic languages. Vowel reductions in unstressed syllables resulted, making most nominal inflections indistinguishable, especially when combined with the loss of final -s and -m, which were preserved in writing but not in speech even in Classical times. As a result, the old five-case inflection system underwent a catastrophic collapse in Proto-Romance to a two-case system, later reduced to one case except in Romanian, where the Slavic adstrate probably helped preserve it. In French specifically, the stress became even stronger under the Frankish superstrate, causing even more drastic reductions that separated French from its siblings, before distinctive word stress was lost altogether in the most recent phase. By contrast, the Uralic languages have fixed initial stress that is reconstructible to Proto-Altaic, though a few languages have changed it. The stress was and is strong enough to produce vowel reductions in Finnish, the most conservative of the lot, but has not induced any serious restructuring even in Hungarian, where the stress is very strong today. Only six cases are reconstructible to Proto-Uralic, the rest being innovations of a fairly straightforward kind, as Wojciech says. Altaic is a complex story, and may not constitute a genetic family at all. In any case, the notion that (as Voltaire supposedly said) "etymology is a science in which the consonants count for very little and the vowels for nothing at all" is a parochial Indo-European view. In Austronesian, the five vowels are typically entirely unchanged from Proto-Austronesian, whereas the consonants engage in such otherwise bizarre shifts as y > p, dr > kʰ, l > ŋg, and often play musical chairs, especially in Oceanic. do Finnish and Hungarian have any stress at all, let alone a strong one? I thought vowel harmony did the job i'them. Finnish I can't tell, but the Hungarian 'stress' (initial) seems rather weak to me. French retained a two-case system (as did Provencal, but not Italian nor the Iberic languages) well into the middle ages, murs-mur, mur-murs. I think you overestimate the influence of Germanic phonetics on the Romance. I mentioned the loss of Latin case inflections in the context of John Wells' post - how does a novel pronunciation become popular? Or to generalize, how does any linguistic change become established (or rejected)? Speech communication is self-regulating, any new variation has to be comprehensible immediately, and then learnable by the next generation of babies. Subsequent spreading through the community might be retarded or rejected by inhibitive forces like group bonding ("we don't do that here"), prescription ("that's incorrect") and so on. (2) Final syllables were allowed to weaken once they no longer included case information after inflections had been abandoned. The first means that case inflections were eroded by accident, the second means they were discarded (like some of us have discarded that syllable in "deteriorate"). My mentioning Turkic and Fenno-Ugric was unnecessarily distracting. What had struck me was the arbitrariness in the contrast between long-standing stability over such a vast area, and the upheaval in Latin, with regard to case morphology. Abandoning Latin case inflections is remarkable in that they seem to have been voluntarily depriving themselves of the semantic content of the various case functions. And it was happening all over the empire. Yet it can't have affected comprehension, and it became increasingly popular everywhere. Wojciech has the key, reminding me of one of my own unrevised chicken and egg arguments, that the speakers of Vulgar Latin repaired the havoc by turning to prepositions. They didn't. Continued successful comprehension shows there was no havoc. The key: there were two rival systems in classical Latin itself, and the Vulgar Latin speakers of the empire dispensed with the case inflections and continued to express case functions with the already familiar and working preposition-based system. The phonological changes in Latin constitute an adequate (I would say plausible) explanation for the reduction of the case system to two. But a two-case system can be stable — as our own language has shown throughout Middle English and Modern English. A book I'm trying to read on French syntax states confidently that the coup de grace for the Latin case system was the transition to SVO syntax. It does seem plausible. Latin had disposed of Dative inflection in favour of something derived from ad + Accusative, and dropped Genitive inflection for a relic of de + Accusative. (Not a sudden development in Late Latin, but the continuation of a long-established tendency that had been suppressed in the Classic literary language.) But there was no corresponding preposition to replace bare Accusative as Direct Object. Fixed default SVO order meant that — in unmarked instances — the Object was clearly distinguished from the Subject by position. As an undergraduate, I had to read some Old French texts with two cases intact. They felt no different from other Old French texts. This seems to support a claim I've seen that the case endings in early Gallo-Roman are actually redundant in all the surviving texts. Abandoning Latin case inflections is remarkable in that they seem to have been voluntarily depriving themselves of the semantic content of the various case functions. And it was happening all over the empire. A language at any period may draw on two or three simultaneously. This may serve to provide desirable redundancy as in Whom did you see? or a friend of John's. Two devices may combine as in to him. And all three are involved in To whom are you speaking? • Classical Latin made little use of word order, though I've seen it claimed that SOV was the default order, making any other order marked for a particular effect. • Until very late in Latin history, case inflection was used, even though the six of Classical Latin were reduced to two. • Prepositions were used in combination with case endings for all but a small but extremely important core of relationships signaled by single inflected words alone. In Plautus and in inscriptions there are instances of writers inserting redundant prepositions — a practice said to have been favoured by Emperor Augustus — but this tendency was suppressed in the Classical literary language. To signal these non-Subject-non-Object relationships the two devices were combined. The result in prepositional phrase incorporated redundancy, but that was no bad thing. Speakers needed to know the two case forms at any rate, because they were still felt necessary for distinguishing Subjects from Objects. The establishment of SVO as the default order allowed hearers to recognize Subjects and Objects without the aid of case endings. So now all instances of case ending were redundant. It was no longer worth the effort of memorizing the — still rather non-intuitive — system od declension. In English, much the same process occurred. First, Accusative and Dative were conflated. Next, fixed SVO order served to distinguish Nominative from Oblique. Our Genitive was simple and easily learned — enough to it preserve as an alternative to of +NOUN. Wojciech asks about Swedish. I suspect that the history was very similar. Dave: Yes indeed, fixed word order was part of the complete story, a prerequisite for abandoning case inflections. As far as is known, it's only French that went through a V2 phase, presumably under the influence of the Frankish substrate. All of the Germanic languages had a V2 phase, and many remain so. As someone who is not a linguist by profession, but who nonetheless is deeply interested in and by language, I confess to having considerable sympathy with the allegedly naïve view that a word is not a word unless it can be found in a reputable dictionary and unless it is spelled in a manner recognised as correct by a reputable dictionary. I would even go so far as to suggest that entries tagged as "colloquial" or "slang" could reasonably be disregarded in this context, thereby immediately removing the elevated status of "word" from such abominations as "gonna", a deliberate elision of the two elements "going" and "to" to accord with the informal speech patterns of some strata of society. However, in making this statement, I do have two important caveats in mind : (1) that, by definition, this is in the context of /written/ language (it is, I dare to suggest, meaningless to ask if a particular spoken utterance is or is not a word : I anticipate one or two robust challenges to this assertion ! ), and (2) that it applies only to languages for which there is a considerable extant body of lexicography (it would be unreasonable to apply it to a newly discovered language for which few if any reliable lexica yet exist). It would be interesting to know whether this is the position adopted by L'Académie française for the French language : I suspect that it might be. The position that any lexicon can contain all the words of the written language is not one that any lexicographer would endorse. Fixed wordlists are for Scrabble, not for human languages. I understand that, John, if by "any lexicon" you mean "any one lexicon"; my own definition was somewhat looser, in that to be a word a would-be word must occur an /a/ reputable lexicon, not that all words must occur in one single lexicon. However I do see that I am effectively postulating a chicken-and-egg situation, in that no reputable lexicon would include an entry that was not already considered a word in informed circles; this can in part be overcome if a word can be tagged as "Not yet regarded as a bona fide word", but the more I think about it the more I appreciate just how difficult it is to define what is or what is not a word; this is one reason why I so admire the work of L'Académie française and wish we had such an august body for the (British) English language. I/qua an extremely naive user of various languages/'d say that a word, no matter how _mala fide_ (e.g. 'gonna', 'ya' or what not) if it is a real word, will be inside of _a_ dictionary, though certainly not all of them. An _ad hoc_ word creation won't, but then it won't be a real word, either, will it? Unless, and until, it has taken root, been adopted by some speakers. A problem are perhaps 'potential words', such as 'John-Wellsian' (coined by myself here), that are, in a sense, real words (everyone understands them at once) and yet by definition are not listed in a lexicon. In Polish 'żyrafiarnia', 'giraffe stable', not in any reputable or disreputable lexicon, yet a 'real word', I feel. But (and I hate to drag this thread out unnecessarily) what of neologisms ? Let us consider a word such as "boson", first used by Dirac in 1947 : "The new statistics was first studied by Bose, so we shall call particles for which only symmetrical states occur in nature bosons". 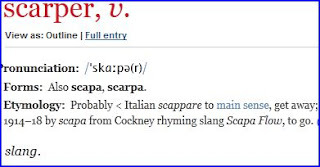 During the period between that first occurrence and its first appearance in a dictionary, what was it if not a word ? A neologism coined for serious purposes---like your 'boson'---is doubtlessly a real word when it starts being used by other people (than its coiner) even before it has made it into a dictionary... so the presence in a dictionary is not a 100 p.c. reliable criterion. Says a naive, nay, extremely naive user of languages. P'r'aps a better criterion would be the occurrence of the apparent word in (serious) texts other than monologues of its coiner. One puzzling (me) case is 'to deprecate', not a neologism, but an old word which meant and still means 'to express disapproval' but in a computer-speak it acquired (like in the late '90'ies, I'd guess) the meaning of 'to give up, to no longer use' with reference to a software feature or such. How did this come about? Perhaps due to contamination with 'depreciate'...? It's funny to imagine computer-freaks 'deprecating' (in the original sense) various software features. Maybe whether or not something is a real word depends on the context. Sure fing, Ellen, you are some markswoman! 'Deteriate' and 'februy' ARE real words in certain contexts, as is 'glamour', after it had branched off from 'grammar'. The question is, how reputable these contexts be. 'Glamour' was a 'grammar's 'deteriate' or 'februy' for a while, and then got reputable, nay, very reputable contexts---glamorous ones, so to speak. Word in the sense under discussion means 'lexical item'. What this amounts to is 'item in a speaker's lexicon'. Common 'words' are items in the lexicons of virtually all speakers. Rare 'words' are items shared by smaller bodies of speakers. Although extremely rare, it is in principle quite possible for one individual's lexicon to be in conflict with another individual's lexicon. •The pronunciation either has a second r sound or it doesn't. • The spelling is conventional February even though it does not correspond to most individual pronunciations. Thus, for the vast majority of English speakers there are two and only two 'words' with the conventional spellings deteriorate and February. • There may or may not be a tiny minority of English speakers with two 'words' spelled deteriorate and deteriate. As long as that minority remains tiny, there is no need to recognize two 'words' in the communal lexicon of the totality of English speakers. • I find it hard to believe that any individual speaker has two distinct words for 'the second month' in his or her lexicon. One lexical item with the meaning second month of the year' is common to most individual lexicons. Hi Dave, I by and large agree with what you're saying above, in my reply to Ellen I tried to suggest (very roundaboutly perhaps) that 'deteriate' and 'Februy' are real words in let us say substandard contexts, without wishing to say this evaluative word 'substandard' explicitly. Same goes (does it not?) for 'gonna'---is 'going to' and 'gonna' different words in a John Bull's lexicon? Sounds not right somehow, on this I share your feeling, it would sound righter to say, perhaps, that they be two-ish words in two different _registers_ of a John Bull's English: the formal and the sloppy. Re 'glamour': I was not saying of course (sorry if I gave this impression to anyone) that it TODAY be on a par with 'Februy': I'd suspect, though, that it once was, then it took root, got generally accepted in a new meaning (this person has a lot of glamour about them even if they do not have much grammar, tekhne grammatike) --- and, ended up as what it is today, a mature, sovereign, prestigious even, 'British subject' in the realm of language. Thinkable, perhaps, that 'deteriate' will come to mean, one day, something like 'worsen in a particularly disgusting, demoralising way' or some such....? Sweden publishes a list of new Swedish words each year. There's no difficulty about what constitutes a word (see David Crosbie's definition just above). To be included in the list, a new word has to have been used a minimum number of times during the year. Google attacked the definition of the word "googlebar" (googleable) in last year's list. The publisher preferred to remove the word. The Swedish National Encyclopedia promptly added the word to its online version. I just got 678 hits when googling for ungoogleability, 55,000 for googleability, while boson got 11,900,000. Thus --- all is well in the state of Sweden? Here's a difficult one: How would you explain the disappearance of cases in Swedish? It seems that if we listen to these August Swedish bodies, ogooglebar simultaneously isn't a word, and is a word, after all. Since such legislation is issued in writing, a Swedish word turns out to be what those folk John was criticising say it is — a written form which is a dictionary entry. Its spoken form (pronunciation) is secondary, and its meaning is open to litigation. It's only marginally different in an academy-free language like English. However many new lexical items arise among English speakers, only those that are recorded will be recognised as 'words'. And, until somebody invents a spoken internet, that means they must be written down. Think of all the slang words we know simply because somebody once took the trouble to write them down. Then think of all the slang words that we'll never ever know of, even though they were once shared by hundreds of people. I can very well invent a new word, say 'burlac', invest it with no meaning whatever, and yet use it in such contexts as 'that monster of a non-word, "burlac"..' or 'you're a burlac, whatever that means' or such. After a time, these _pronunciamientos_ of mine or maybe of a few fools who ape me will be recorded (as we know next to everything gets recorded and is thenceforward call-up-able on the Web) and ... well, if the Swedish bodies work with purely syntactic criteria, 'burlac' will become a new 'ord' (ett nytt engelskt ord)... Hope this scenario is wrong... .
My line has, by contrast, always been that a word, to be a real word (which is not the same as being recognised, acknowledged as one) must have been used (not necessarily recorded) several times _in serious contexts_ by not just its coiner. See Profile for full true name! Such words sooner or later make it into dictionaries --- and thus arises (well, in the context of Easter it's right to use that word) the naive view that John (Wells) has deprecated. David: This isn't a problem. The idea that words only exist in dictionaries would have ridiculous consequences, like no additions to existing dictionaries or never a dictionary for languages that haven't yet got one. As to the "ogooglebar" incident, all that has happened is that the compiler has hidden it (the 2012 new word list isn't a book), it's still used regularly in Swedish. The Academy isn't involved, but they have commented that (assuming continued frequent usage) they will include the word in the next edition of their spelling list (a handbook they've published since 1874). Googling (also a fairly recent new English word) for "googlebar", I got 5 million hits. Wojciech: the criteria for that annual Swedish new word list include frequency of usage and definable meaning. I don't think its compilers would find any difficulty in your stand, they're simply one step behind you, counting what has happened once the dust has settled. Manufacturers often spend a lot of money to turn their trade marks into household words, and then find that we consumers have made generic words of them. Do you hoover with any vacuum cleaner? Do people still kodak their kids? Will the web become ungoogleable if sea levels rise? But definable meaning---how do they go about establishing _that_??? I'd really be interested... do they use flesh-and-blood experts or just computer analyses? If the latter, what could these analyses be like? Or do they---a thought so impious that I dare hardly formulate it---go by merely intuitive criteria? Originally deprecate meant 'pray against' < Latin deprecor. By contamination with depreciate, it came to mean 'disapprove of', but was generally milder than depreciate (which also has the sense 'lose value' that deprecate does not). The computer use is a straightforward extension: if we disapprove of something in a standard, we urge people not to use it but without actually forbidding it; thus features may be deprecated from version 2 of a standard, removed in version 3, but still supported by implementations for the sake of backward compatibility. ah, so you share my feeling that 'depreciate' was being contaminated with at some stage...? this 'disapproving in the sense of urging not to without actually forbidding' is a very tricky deontic phenomenon (it's not the same as 'warning that something from now on counts as obsolete', for instance) which we can't discuss here, though, as it is purely philosophical (in the technical sense). But, this is my point, perhaps exactly for that reason they invented a new word for it, or gave a new meaning to an old one. Ad Wojciech -- as one whose natural domain is IT, and to whom the use of "deprecate" in this context is not only unexceptionable but entirely natural, I wonder whether our different reactions to its use stem from different interpretations as to the role it normally plays. Where you have written (above) "Why not simply 'give up', 'no longer support', 'eliminate' etc. depending on the context? ", all of these are in the active voice, whereas in reality "deprecate" (in this context at least) is invariably used in the passive voice : "X is deprecated" is the norm; "We deprecate the use of X" I have never encountered in the domain of IT. Incidentally, at least one of the major grammarians of the proscriptive/prescriptive era wrote on this very subject, and advocated the use of "depreciate" to carry the very semantics that we now associate with "deprecate", basing his argument on the fact that (as John Cowan has already written) "to deprecate" is to pray against (something). I will endeavour to locate the reference. 'This feature was given up/abandoned/is no longer supported'? I have made my peace with 'deprecate', don't worry. I suppose it was felt as 'fancier' or 'more beautiful' than 'abandon', plus the mixing-up with 'depreciate'. In fact the very first time I came across the word, like about 2000, I thought it was a spelling error from 'depreciate'. I had known 'deprecate' in the traditional meaning. Maybe it conveys the meaning of 'to no longer use the thing and discourage, for quasi- but not exactly normative reasons, the user from using it and expecting it to be used'? Something like that? It does carry slightly quasi-normative overtones, does it not? Ad Wojciech -- "Quasi-normative overtones", yes; "to no longer use the thing and discourage", no : closer would be "to no longer recommend the use of and to discourage" -- i.e., the one who deprecates (the author of the package) is not the one who uses it; hence "X is deprecated" means "You (the user) should no longer use X", not "I no longer use X". Perhaps the most obvious substitute is simply "X is discouraged", but that would have to be padded out to read "the use of X is discouraged" whereas "X is deprecated" already carries those overtones. at least among the cognoscenti. 'x is deprecated' implies (but is not equivalent to) 'x is considered detrimental to the further development of the software, a left-over from some bad old days, non recommendable for independent reasons, superseded by something better'... something like that... . Sometimes some vested interest of the soft- and hardware-manufacturing community may be at work, too, I'd suppose. That is why it is not simply equivalent to the matter-of-factly 'given up'. OK, nobody cares anymore I fear whether off- or on-topic, old stuff, neige d'antan. A very interesting observation, your last one with the not-yet-having-been-given-up-but-soon-might, this and the vested interests stuff belong, methinks, to semantics: why new real words are constantly being invented and that out of a need. All of this helps me to resign myself to the existence of the verb at issue and to acquiesce with it. it would interest me why (you guys think that) 'hipopotamus' never haplogises. Save Eliot's poem: '... the 'potamus can never reach//the mango from the mango tree'.